EurekaLog can be used with DLLs compiled by non-Embarcadero compilers - such as Microsoft Visual Studio, etc. 3rd party compiler must generate debug information in some of supported by EurekaLog formats (see list). Your application should use the single exception tracer scheme. Note: PDB format is a modern debug information format for Microsoft Visual Studio tool chain. It can contain much more information than older DBG debug information format. DBG format support is limited in many tools. For example. It is recommended to use PDB format when possible. You can mix EurekaLog-enabled DLLs and 3rd party compilers DLLs in the same application. In other words, EurekaLog-enabled DLLs with "DLL" profile (i.e. without exception tracer in DLL) are interchangeable with DLLs compiled by 3rd party compiler for all of the 3 cases above (i.e. converting debug information to EurekaLog format, enabling support for additional formats, or using plain DLL exports information). 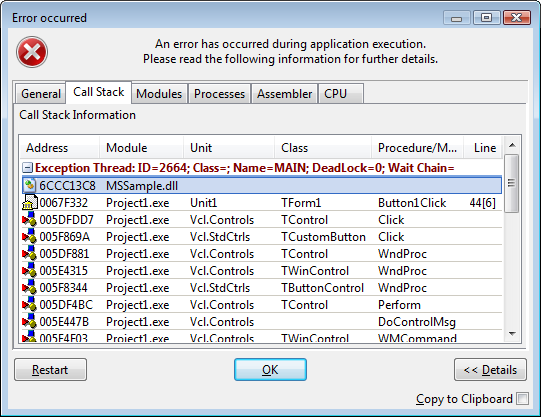 "Standalone DLL" profile is not compatible with 3rd party exception tracers. This sample DLL is compiled by Microsoft Visual Studio. It contains one exported function (fnMSSample) which calls some internal functions (Test and InternalTest) and raises access violation exception. It is loaded and called by the Delphi project (.exe host). You should enable EurekaLog for host application. You should do this in the same way as you do it for typical application without any DLLs. For example, if you have VCL Forms application as the host - then you need to enable EurekaLog for host application and set application type to "VCL Forms Application". This will add EurekaLog code and data into final .exe file. It would also set hook for Forms.TApplication.HandleException method, which will allow to automatically handle exceptions without writing any code. Important note: Please note that above example is not recommended to use in real projects. 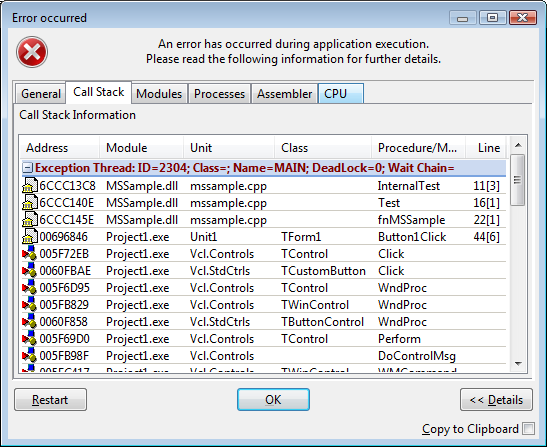 The example above is created to illustrate differences in debug information for DLLs. It is not intended to illustrate DLL design principles. The problem with example design is as following: the sample DLL does not contain any try/catch handlers, and it lets exceptions escape DLL to the caller. This is usually a bad practice - because the caller may not know how to work with exceptions coming from other programming language. The above example uses hardware exception for illustration. Real-life application will probably raise software exceptions - which are specific to programming language. Thus, a better idea is to wrap fnMSSample function into try/catch block and convert exception into safe error code (a simple flag, integer code, HRESULT, etc.) - as explained in this article. • Disable "Capture stack only for exceptions from current module" option. This will instruct EurekaLog to catch exceptions from any executable module. By default EurekaLog captures only exceptions within the same module. • Disable chained exceptions support by setting all options to "Classic" position. This feature requires ability to track life time of exceptions objects. This is not possible for general case (e.g. 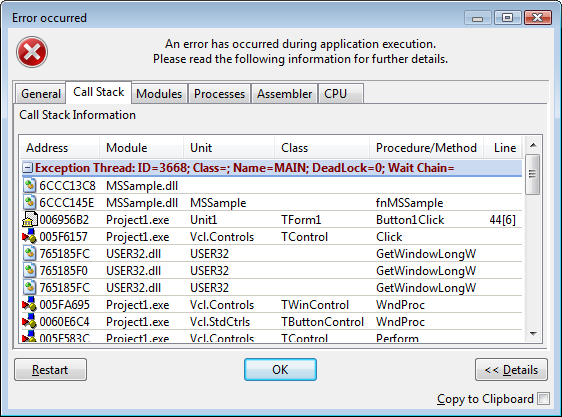 host and DLL are compiled by different compilers and there is no assist from RTL for tracking exception objects). This feature may work in some specific configurations. You don't need to perform these changes if you're using the recommended approach of not letting exceptions escape DLL. See example here. The last step will fail because DLL was already unloaded. This is the reason behind explicit call to Application.HandleException. Please note that you don't need such call if you use different buttons to load DLL/call function/unload DLL - that is because default exception handler will guard each call of event handler. As you can see: the call stack lists every function within host .exe file - because host .exe has EurekaLog debug information. DLL have no debug information. Therefore, EurekaLog is unable to show call stack for DLL. Empty first line is exact exception address. It is shown always - regardless of debug information available. Of course, this is not a very useful bug report for DLL. You want to see some functions from that DLL. 3. Use DLL exports provider (no debug information is available or debug information format is not supported). This approach is not recommended - because there will be inaccurate information in call stacks without debug information. This case should be used only if compiler is not able to produce debug information or debug information format is unknown to EurekaLog. Use this approach as "last resort" measure: to show at least something for DLLs without debug information. 1. Enable DLL exports debug information provider (see description of this provider). Note: this case is a default configuration for EurekaLog. This example is able to discover name of exported function ('fnMSSample') - thanks to DLL Export provider. However, this example is not able to identify internal functions in DLL - because internal functions are not exported. Therefore, internal functions are not listed at all. And (as always) exact exception location is added to the top of the call stack. Please note that this example also adds entries for USER32.dll and KERNEL32.dll in the call stack. • [False-positive] Address does not belong to the specified function. JMP/RET instruction marks the end of the function. Address itself lies within some other internal/unknown function after the specified function. Number after "+" sign indicate byte offset between function's start and call stack address. Greater offsets usually indicate greater chance for false-positive entries. This approach can be used if you want to use other tools for your executable (for example: Process Explorer, WinDBG, external debugger, etc.). Other tools are not able to recognize and read EurekaLog debug information. Thus, you need to supply and keep debug information in a known format - such as PDB/DBG, TD32, etc. Both EurekaLog and other tools will be able to use this debug information. 2. Enable support for debug information format in EurekaLog's project options (see list of supported formats). For example, we use Microsoft Visual Studio in the above example. You can go to "Project" / "Properties" IDE menu item to open options for your C++ DLL project. Go to "Configuration Properties" / "Linker" / "Debugging" and enable "Generate debug info" option. Go to Go to "Configuration Properties" / "C/C++" / "General" and set "Debug Information Format" option option to "Program Database" (/Zi option for ompiler) or "Program Database for Edit And Continue" (/ZI option for compiler). Build your project. There should be .pdb file available in the same folder as .dll file for your project. You should deploy this .pdb file with your .dll file. Enable support for PDB debug information format by enabling "Microsoft Dbg/PDB" option. Note: you can enable generation of .map files in your Visual Studio projects. However, such files can not be used by EurekaLog. .map files do not have a strict format. .map files are defined as "human-readable plain text files in free form that indicate the relative offsets of functions for a given version of a compiled binary". EurekaLog is able to parse .map files produced by Delphi and C++ Builder linkers. EurekaLog is not able to parse .map files produced by other compilers/linkers/tools. Since DLL now have full debug information available in .pdb file, and EurekaLog has enabled support for reading .pdb files - there will be full information for your DLL in the call stack. All exported and internal functions will be properly identified. All functions will have line numbers information. • IMPORTANT: (only for "Microsoft Dbg/PDB" provider) You have to deploy DbgHelp.dll file from Microsoft Debugging Tools. This file can also be found in \Bin (\Bin64) folder of EurekaLog installation. Default DbgHelp.dll from C:\Windows is not suitable for such usage. • You can also enable debug information for Windows DLLs to show precise information about internal functions in system DLLs. This configuration is explained here. .pdb files are analog of .tds files (with TD32 debug information): these files are extremely large (debug information file could be more than 10x times larger than executable module itself), binary, uncompressed, unencrypted, store huge amount information about executable (functions, arguments, types, classes, scopes, line numbers, etc. - in other words, all information that may be needed for the debugger). Since exception tracer does not need all this information (units/routine names and line numbers are enough) - obviously, deploying such files along with your DLLs is not a best solution. Surely, you have to use .pdb files if you need to load your DLL into other tools (such as Process Explorer or WinDBG), but if you just want to use exception tracer tool with your DLL - there must be a better way. A better way is to convert 3rd party debug information into EurekaLog debug information. EurekaLog debug information is compact, compressed, encrypted and stores only minimum amount of information necessary to build call stack. All other extra information is not stored. And you won't need any external helper DLLs - like DbgHelp.dll. This is recommended approach. You can convert some supported debug information formats into EurekaLog debug information format. You can do this without DLL recompilation. 3. Run ecc32.exe or emake.exe to post-process your DLL file with embedding EurekaLog debug information (see below). Ecc32/emake tools can use --el_alter_exe command line switch to specify target .dll file for post-processing (you should use NUL as project file name for --el_alter_exe switch - since your DLL is not a Delphi / C++ Builder project), --el_config switch to specify EurekaLog configuration (you have to use external .eof file since there is no Delphi / C++ Builder project to read configuration from), --el_source to specify debug information source (default source is Delphi / C++ Builder .map files; you have to specify where ecc32/emake should look for debug information). • You have to create new .eof file which will contain EurekaLog configuration for your DLL. This file is required since there is no Delphi / C++ Builder project (which usually stores EurekaLog configuration). • Most options in .eof file will be ignored since there is no EurekaLog code in your DLL. Only design-time / build options will be used: such as encryption for debug information, stripping relocs, removing function names, etc. • You can enable generation of .map files in your Visual Studio projects. However, such files can not be used by EurekaLog. .map files do not have a strict format. .map files are defined as "human-readable plain text files in free form that indicate the relative offsets of functions for a given version of a compiled binary". EurekaLog is able to parse .map files produced by Delphi and C++ Builder linkers. EurekaLog is not able to parse .map files produced by other compilers/linkers/tools. Therefore, only Delphi / C++ Builder .map files could be used for post-processing. Other possible source includes .tds files (TD32), any format that DbgHelp supports (usually: .pdb and .dbg files). • PDB format is a modern debug information format for Microsoft Visual Studio tool chain. It can contain much more information than older DBG debug information format. DBG format support is limited in many tools. For example. It is recommended to use PDB format when possible. For example, we have Microsoft Visual Studio DLL project as described above. Project have some internal function and exports one function (fnMSSample). You can go to "Project" / "Properties" IDE menu item to open options for your C++ DLL project. Go to "Configuration Properties" / "Linker" / "Debugging" and enable "Generate debug info" option. Go to Go to "Configuration Properties" / "C/C++" / "General" and set "Debug Information Format" option option to "Program Database" (/Zi option for ompiler) or "Program Database for Edit And Continue" (/ZI option for compiler). Build your project. There should be .pdb file available in the same folder as .dll file for your project. This command line will convert MSSample.pdb file into EurekaLog format and inject this information into MSSample.dll file. Options for this operation are specified in MSSample.eof file. Note: MSSample.pdb file may be deleted after conversion - depending on the state of "Delete service files after compilation" option. This call stack will be the same as in the previous approach: DLL now have full debug information which is injected into DLL file - there will be full information for your DLL in the call stack. All exported and internal functions will be properly identified. All functions will have line numbers information. The difference from the previous approach is that you don't need to deploy any additional files along with your DLL. All necessary debug information is stored inside DLL file itself.